When Chris was placed in a private guesthouse after being kicked out by his partner, he was taken aback by the Dickensian squalor. “It was a shock,” he recalls. “The stench was overpowering – it was a mixture of everything: alcohol, body odour, fag ash, vomit. My room was so tiny that I could touch both walls at once. My door wouldn’t lock and was hanging on one hinge. The plasterboard walls were so thin he could hear neighbours coughing and snoring. Tenants openly took drugs and doors would regularly be kicked in and belongings pinched. Chris, 47, avoided the communal bathroom – also filthy – as much as possible, preferring to wash using the sink in his room. The kitchen was out of bounds to tenants and the meals were barely edible. Linen went unchanged for extended periods of time and the advertised laundry facilities did not exist. For this, the landlord earned £160 per week in housing benefit per resident – plus a mandatory weekly top-up from tenants of £20. 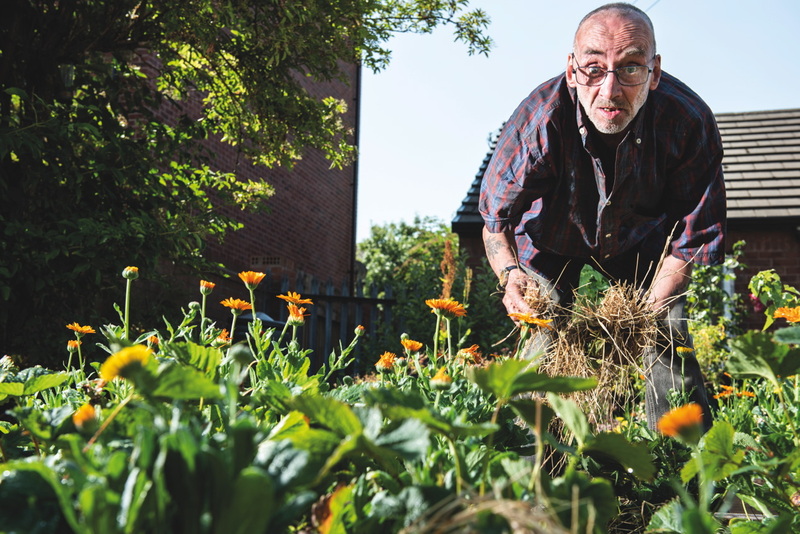 Chris’s time in the twilight zone of Manchester’s temporary housing network took a serious toll on his physical and mental health. He lost weight, his skin was in poor condition, he neglected his teeth and he was constantly lethargic. Not normally a drug user, he tried heroin while living there, out of curiosity and boredom. Nevertheless, he got off comparatively lightly. His stay last year lasted for three months, which he says felt like three decades. Many less fortunate people spend years stuck in accommodation like this – voiceless, all but forgotten by the authorities and with the possibility of arbitrary eviction a constant fear. Researchers have met tenants who have lived in what is known as unsupported temporary accommodation (UTA) for as long as 36 years. They say if these residents were recognised for what they really are –hidden homeless – the government’s official statistics could be 10 times higher than the current figures. This form of housing is so marginal that most tenants have few official rights. As single adults, few qualify for help to secure more settled housing, meaning they fall outside the statutory definitions of homelessness and therefore the national data. Many are vulnerable and fall into cycles of rough sleeping or relapse into addiction. The refusal of many regular private landlords to take tenants on housing benefit can leave the most marginalised people with few options except for UTA when they get into difficulties. It was the charity Justlife that stepped in to help Chris move into a shared house. Once his situation stabilised he worked as a volunteer and went on to find a permanent job elsewhere within the voluntary sector. Based in East Manchester and also operating in Brighton, the organisation runs a day centre and provides advice and support to people living in UTA. It also has a policy team that raises awareness of the issue among commissioners and decision-makers. Christa Maciver, lead for research and policy at Justlife, says: “It’s very difficult for people to get their life together when they are placed in this kind of accommodation. These places are really grim and insecure. People are meant to have certain legal rights but landlords in these places don’t always grant these – they don’t give people keys to their rooms sometimes and often enter rooms without warning. “Tenants often don’t have a licence agreement and have no privacy or security. Very often people’s mental and physical health declines in these places and some people die there. “When Justlife launched a decade ago, following the death of someone our founders knew who had left prison and was living in UTA, we hoped to get them shut down altogether. However, because there’s so little alternative housing available that’s currently very difficult. If these places ceased to exist, where would tenants end up? In joint research with the Institute for Public Policy Research (IPPR) North, Justlife interviewed 45 people about their experiences of this type of accommodation. Thirty-eight reported deteriorating mental health and 21 worsening physical health. Participants frequently reported living without heating or hot water, damp caused by leaks, and rats and bedbugs. Most had lived in this type of housing for at least a year and one had been in UTA for 36 years. The charity also used Freedom on Information requests to ask councils in England how many people were living in B&Bs while claiming housing benefit. Numbers during 2015-16 were upwards of 51,500 – roughly 10 times higher than the official B&B placement figures for the same period. Some estimates put the current number of people living in UTA in England as high as 75,000. The team also found that while some guesthouses in Manchester are so notorious that the council housing team won’t use them, other authorities are willing to. Neighbouring councils place people in these establishments, as do adult social care, probation and third-sector housing organisations, undermining efforts to blacklist unsuitable accommodation. According to the IPPR North report The Journey Home, even when councils are keen to take action, their enforcement powers are limited because of lack of resources, and Maciver says guesthouses get advance warning when they are about to be inspected. “Residents tell us they can tell when this is going to happen because the kitchen gets unlocked, the mushrooms are scrubbed out of the bathroom and there is a smell of bleach,” she says. The market does little to address such problems. Councils fear that instead of leading to improved conditions, any clampdown on landlords would reduce the amount of accommodation available or, conversely, that improvements in the accommodation would lead rents to rise and spaces let out to less vulnerable people. Greater Manchester mayor Andy Burnham has announced an amnesty for dodgy landlords who refuse to comply with his drive to raise standards in the private-rented sector. He says ownership of unfit, unsafe properties could be transferred as a way of avoiding enforcement action, under his planned Greater Manchester Good Landlord Scheme. Justlife has been commissioned to research UTA around the North West and is working with others to improve the system. One of IPPR North’s recommendations was the creation of formal temporary accommodation boards, to monitor local establishments and the individuals living in them. This has happened in Manchester over the past two years – Chris now takes part as a former resident – as well as in Brighton and Hackney. The boards are leading to improved relationships between local authorities, the fire service, police, drug and alcohol teams, mental health, probation, the third sector, landlords and residents. They could create lists of acceptable and unacceptable accommodation and a minimum set of standards. Some B&B owners are now trying to become registered social landlords in the wake of the roll out of Universal Credit, which is normally paid directly to tenants and which some refuse to accept. Temporary accommodation boards could monitor these transitions to ensure improvements are actually made to properties and support standards. Sue Murphy, deputy leader of Manchester City Council, says: “Manchester people have the right to decent living standards and this is something we endeavour to ensure. “Working closer with landlord and residents in B&Bs and other accommodation is important to understand issues and will help to improve standards. “As such, we are fully supportive of the brilliant work Justlife is doing through the temporary accommodation board, as well as the Manchester Homelessness Partnership, who are also looking at unsupported temporary accommodation. These groups help us share best practice and react to problem areas, including the impact of Universal Credit on already vulnerable people. Burnham, adds: “Justlife have done sterling work in highlighting the terrible conditions and insecurity which face many people in the private rented sector. This is often the only option open to people who are homeless or in desperate need and it’s simply not acceptable in 2019. “Too often, the private rented sector can also contribute to homelessness, but it doesn’t have to be this way. There are good landlords in Greater Manchester and that’s why we want to work with them to prevent and address homelessness and also to highlight where good landlords are making a difference. A novelist has worked with people living in unsupported temporary accommodation to bring their experiences to a wider audience. Over the course of about a year, author Sarah Butler, a lecturer at Manchester Metropolitan University, collaborated with people who use Justlife’s drop-in centre to create a narrative based on their lives. Not Home weaves their story into a piece of fiction about a group of people living in a grim guesthouse. During the writing process, the author shared her drafts with participants and invited them to comment on its accuracy. The finished book also includes a number of first-person stories taken from interviews with the participants. The project is part of a drive by Justlife to increase awareness of unsupported temporary accommodation outside the homelessness sector. Stories from the book will be displayed along with portraits by photographer Stephen King at Manchester’s People’s History Museum until 31 March. Not Home is freely downloadable via justlife.org.uk.